A growing number of people are adopting a vegetarian or vegan diet because of the health and environmental benefits that go along with them. As the number of non-meat eaters rise, the processed food industry has been quick to adapt their products and create new brands to cater to this burgeoning multi-billion dollar market. But despite claims of being "all natural", many of these products have been heavily processed. A growing number of people are adopting a vegetarian or vegan diet because of the health and environmental benefits that go along with them. As the number of non-meat eaters rise, the processed food industry has been quick to adapt their products and create new brands to cater to this burgeoning multi-billion dollar market. But despite claims of being “all natural”, many of these products have been heavily processed. Texturized Vegetable Protein (TVP) is a great example. It’s a convincing meat substitute found in many read-to-eat foods that’s often made from denatured soy proteins. The soy protein is a byproduct of producing soybean oil and in many commercial operations, the process of extracting soybean oil (and many other oils such as canola and corn) involves introducing a solvent called hexane. Hexane is a petroleum byproduct of gasoline production and is a cheap industrial solvent that the EPA classifies as a neurotoxin. In fact you may remember hearing about a rash of mystery illnesses amongst Chinese factory workers assembling iPhones, which was eventually linked to the hexane used to clean the devices’ screens. So why would the FDA allow such a dangerous chemical to be used in food products? Because in theory it’s all supposed to evaporate. In reality, not all of the hexane evaporates as shown in Cornucopia Institute’s report on Hexane in soy products. Since the FDA does not require companies to test for Hexane residues in their products, there could be a lot of Hexane residue in your food and you wouldn’t know it until you got sick. That’s why it’s so important to cook using whole ingredients and to limit your intake of processed foods. The less processed a food is, the fewer chances it has of some dangerous contaminent being introduced. In Asia, where Buddhists have been following a vegan diet long before frankenfoods such as TVP and mycoprotein were invented, they’ve found creative ways of making mock meats without dousing them with chemicals. Today I want to share with you a technique I’ve refined to turn tofu into a convincing alternative to ground meat. At a very simplistic level, ground meat is just meat proteins, water and fat. Similarly tofu is just soy proteins, water and fat. The biggest difference is that tofu has much more water and less fat than meat. By changing this balance you can create a crumbly vegan ground meat that tastes and looks like the real thing after being sautéed and seasoned. The trick is to take advantage of the slow chilling that makes home freezers a poor device for freezing produce. If you’ve ever frozen fresh fruits or vegetables, you’ve probably noticed they lose a significant amount of water when defrosted. This is because home freezers are only cold enough to freeze food over a period of several hours. This slow-freezing causes water molecules to arrange themselves into a crystalline structure. When the food is defrosted, the water melts and flows out of the pores created by the formation of the ice. By freezing tofu in your freezer and defrosting it, you are left with a spongy matrix of soy protein. This is a meat substitute called koridofu (ice tofu) that Japanese monks have used for centuries. The problem is that the resulting tofu has a spongy texture that doesn’t have much resemblance to the fibrous texture of whole cuts of meat. It also retains the soy flavor that many negatively associate with tofu. To reduce the soy flavor I decided to wash the tofu. It worked. 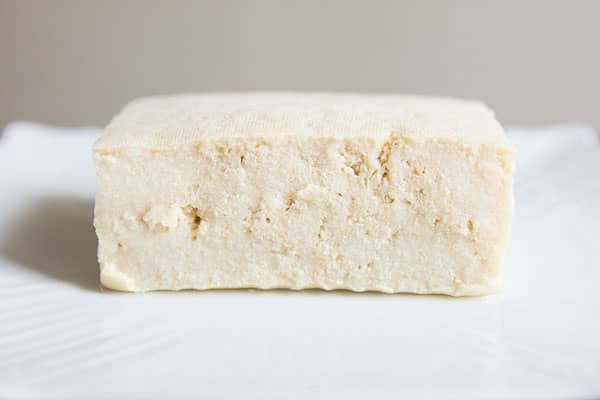 Not only does the washed tofu have a much milder soy aroma, squeezing the water out of the tofu causes it to crumble giving it a texture that closely resembles ground meat. Sautéing the crumbled tofu in vegetable oil firms up the texture and introduces additional fat which gives it a mouthfeel just like real ground meat. While you’re never going to be able to give it a flavor exactly like beef, chicken or pork, in many dishes it doesn’t matter. The meat does however contribute glutamic acids that stimulates umami taste receptors on your tongue. This is what gives meat its savory taste. In order to ensure your dish doesn’t fall flat because of a lack of umami, make sure you’re including other ingredients high in glutamic acids such as onions, mushrooms, garlic, tomatoes, or soy sauce to name a few. I use organic non-GMO firm tofu like this one from House Foods or this one from Nasoya, but if you’re really worried about the safety of your food, grow your own soy beans and make your own tofu. Freeze the tofu in its packaging for at least 24 hours. I usually keep several frozen packs in the freezer at it will last for months. Let it defrost. If you want to speed up the process, just soak the whole package in a bowl of water for an hour. Open the package and drain the water. The tofu will have a spongy texture and squeezing it will release a yellow liquid. Over a colander (to catch any errant pieces), squeeze out as much liquid as you can using he palms of your hand, then rehydrate it under fresh running water. Try to retain it's original shape when squeezing or it will have a tendency to crumble apart. Repeat this washing process 6-8 times until the water coming out of the tofu is clear. The more you wash it the less soy smell it will have. 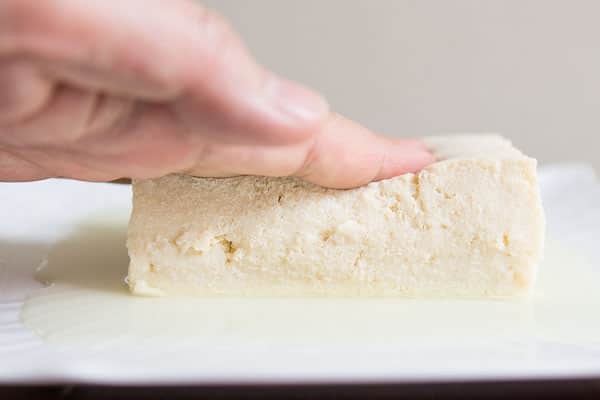 When you're done washing the tofu, use your hands to squeeze the tofu into a ball, squeezing out as much liquid as you can. 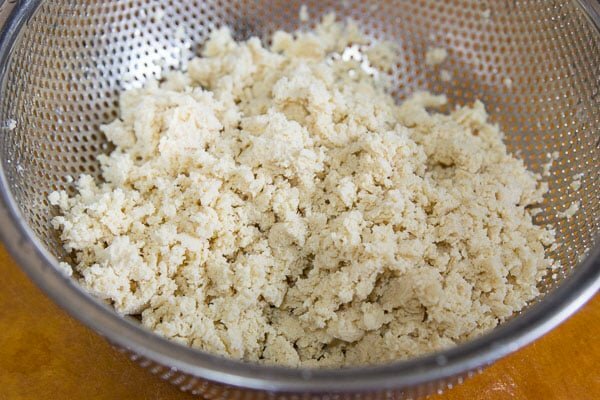 Crumble the tofu until it resembled cooked ground meat. 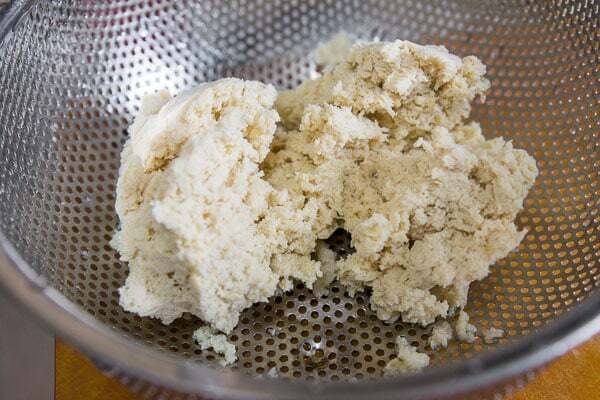 Your tofu is now ready to use just as you would ground chicken, pork or beef. Keep in mind, you'll probably want to increase the amount of oil in whatever dish you use it in to make up for the lower fat content. Great to see this post –As one of the easier methods to make mock meat, I hope this will get more people to experiment with meat alternatives. If I know that I’m going to use my tofu within the week (or two), I’ll take my tofu out of the package and freeze it in a ziplock, and defrost by simmering with kombu/miso or vegan chicken broth. This method cuts out some of the time defrosting and covering up the soy flavor. Great tip Marc! I can’t wait to try it. Thanks for sharing this. I was already familiar with the trick of freezing and then squeezing firm tofu to improve its texture – it was in one of my vegetarian cookbooks from the 80s. However, I didn’t realize that rinsing improved the flavor, and I had *no* idea of the dubious nature of TVP additives. Eek! Thanks for this great post. Awesome post! i always suspected something was up with TVP, sounded too good to be true. this is a great tutorial, i’ll definitely be using it. another easy substitute i used for ground meat is minced portobello or cremini mushrooms. you get a great meaty flavor! Very useful post. Thanks Marc. I love using frozen tofu! It absorbs a lot of flavor. I had no idea TVP was so scary! Very useful indeed! Thanks for the education. I’m going to share this post on Facebook so my vegetarian friends can learn. Hope that’s ok with you. Awesome ! I tried this frozen tofu TVP technique today, it’s so simple I’ll be able to do it as often as I want. Great tips here. I love your photos! Out of curiosity, how would one store this ground tofu “meat” for later use, and how long? I’m going to be cooking for myself most of the time, and assuming I’m not making extra food for leftovers, I’ll probably eat half a block at most. Once it’s been washed and squeezed, I keep it in ziplock bags in the fridge. Should last for up to a week. You could also probably re-freeze it. Erm, would it not be a lot easier to just use real meat instead of horrible tofu goop? The only benefit I can see of going through this ridiculous procedure instead of using real meat would be lower calorie content…. is this the case? Heart Smart beef mince has only 580 kilojoules per 100 grams…. how much lower is this? Unless it was CONSIDERABLY lower why would anyone go to all this trouble to create a bland imitation of meat dish? I tried this many years ago; but I don’t remember squeezing it more than once. I sometimes eat tofu straight—i don’t mind the soy taste, it’s really not much of a taste and as soon as you fry it up with the oil and spices, yum. What kind of seasonings would you recommend using to give it more a meaty flavor? I also use roughly chopped banana heart as a ground meat substitute. It gives a nice texture and takes on flavor 🙂 I use it on vegetarian spring rolls and burgers to add bulk! Also it’s a very inexpensive ingredient here. Meat has hormones, unhealthy saturated fats that cause heart disease, soy has phytonutrients that aren’t found in meat. Also, you don’t have to kill an entire cow to satisfy your desire for spaghetti. Studies are consistently showing that eating a plant based diet (cutting most if not all) animal products from your diet will help you live stronger, feel better, have more vitality and not get the killers (diabetes, heart disease and stroke). Now, eat meat if you want, but don’t think that there isn’t a difference in the short and long term. Would you (or anyone else) know how this process may affect the nutritional content of the tofu? The process is mainly removing water so I do t the the nutritional content should be effected much. I know this thread is old as hell, but another reason I use tofu is that money is T-I-G-H-T here and Tofu can be had for $1 per 1lb block as opposed to +$3 per lb of ground beef. I have been a meat eater all my life and I want to shift to being a vegetarian, but I need to know there are convincing substitutes out there that I can use for my favorite recipes. This is perfect for me. Thanks for this information and recipes Marc! So glad I found this! My husband and I went to #Chicago last week and visited Karyn’s Cooked – a gourmet vegan restaurant. He was surprised the food so good. He said he had no problem eating less meat if he could have meals with soy protein as good as that. Now, I just have to make it happen. Found in the very first line. —> “A growing number of people are adopting a vegetarian or vegan diet because of the health and environmental benefits that go along with them.” NOTE* Veganism is NOT a diet!!! It is a lifestyle. Why do so many people get this wrong?? FYI, the meaty flavour you’re craving is just that; spices. if spices didn’t exist, i’m certain more people would have become vegan decades ago. Hi Steph TC Michele, while everyone’s going to have their own interpretation of words, have a look at the dictionary definition of the word “diet” (http://dictionary.reference.com/browse/diet?s=t) particularly definitions 1,4, and 5. It may also be a lifestyle for some, but it is also a diet. Used this in place of beef for sloppy joes– worked great! I tried this recipe, and if you add some ground beef or pork to it it tastes a lot like meat! The texture is better too. If you leave the tofu out, it is indistinguishable from real meat! Eating a plant based diet, a plant centered diet, or vegan – is a diet. It’s the food selections you make that qualify your diet as being vegan. Not every person who eats a plant centered vegan diet is living a lifestyle. Some people do it for their health and still wear leather shoes, leather coats, silk blouses and shirts and wool coats in winter. I’m one of them. But my DIET is vegan. So Marc is right. I’ve discovered your website two years ago and I wanted to say doomo arigatoo gozaimasu for the wonderful recipes! I am working on lowering my consumption of meats; mostly because I don’t usually have a taste for meat and I could lose a few pounds on my small frame. My body is not a fan of soy; would you happen to have ideas for other plant sources for a ground meat-replacement? Awesome! I happened upon this site looking for a ground beef substitute for an Armenian pumpkin moussaka I was making. The recipe looked so good, but it was labor-intensive and had lots of expensive ingredients. So I didn’t want to screw it up. Well, I followed your directions, added the crumbled tofu instead of the meat, threw in a little extra olive oil and crossed my fingers. The result was amazing. My carnivore husband is coming home in a few minutes. I can’t imagine he won’t be pleased. And if not… Well–more for me! Sounds delicious and glad I could help! I know this is an old topic but I have a question. Is the Tofu used “firm” or “soft” variety? I have had trouble deciding between the two. I’m trying to convert a “greek turkey burger” recipe to meatless and NOTHING has worked for the turkey substitute. (chickpea patties don’t work since I need a “ground meat’ substance) This looks perfect but I don’t want to mess it up using the wrong kind of tofu. Hi Moon.talker, use firm or extra-firm tofu. Soft tofu has too much water content and will not work for this (though it’s delicious for other purposes). Also, you’re going to need to find something to bind the tofu crumbles together as it will not stick together like ground turkey. You could use something like rice flour or potato starch, but adding too much will probably make it a little gummy, so you may want to use a little in combination with something else such as chick peas, grated taro, grated lotus root, etc. Hope that helps. All I need for a good steak is salt and pepper. Obviously there’s more to it than spices and glutamates otherwise I could just put salt and pepper on a piece of fish and call it a ribeye. After sqeezing and crumbling it, dry it. Then it is ready when you need it. I keep some on hand and just throw it into soups. Or let it soak in some type of liquid, then use. So after doing this method to get the ‘ground meat’ likeness, I would like to make a bolognese for two or our 20 guests. Can I then freeze the resulting bolognese and thaw as I would with a meat bolognese when we come to need it?? (I am pre cooking for a celebration that I will not be able to do much for as I will be recovering from hospital and don’t want the old ‘I’ve had a procedure’ excuse to stop me from being a fully functioning adult).